It wouldn’t be Easter without egg-hausting your supply of chocolate and spending some egg-xtra quality time with family and friends. So how about combining the two and enjoying the very best in egg-cellent Easter Egg hunts across London. Apologies if you find the puns too egg-treme, we just want you to have a cracking Easter! Aimed at children aged 3-12 and their families, the yearly Lindt gold bunny hunt has spread this year to include both Kensington and Hampton Court Palace. The Easter Egg hunt is included in your admission price to the palaces so it’s perfect if you’re planning a whole family day out. Follow the clues on the trail and learn about the history of these amazing palaces; one the former home of King Henry VIII, and the other the official residence of some of the royal family. Once you have all your clues, head to the end of the trail to see if it’s enough to claim your tasty prize! Fancy a more grown-up Easter egg hunt this year? DeadDrop are your best bet. Whilst children are welcome at this Easter egg hunt with a difference, they need to like exercise and problem solving to get the most out of it. The premise of the Chocolate Run is as follows: all the chocolate in London has been stolen by an evil gang and it needs saving for the Easter Bunny. Following clues and completing challenges, you must work in teams to find the hidden location of the chocolate. Make sure you wear your workout gear and expect to run, walk and hop your way through some of London’s most iconic landmarks and parks. Expect lots of fun and lots of chocolate along the way as you make your way to the final meeting point where the Easter Bunny should be waiting for you with your prize. This year’s Chocolate Run takes place on Saturday 20th April from 10am-2pm, and tickets cost £30. All finishers get a medal, a beer/soft drink and a bar of Carol Armitage chocolate. 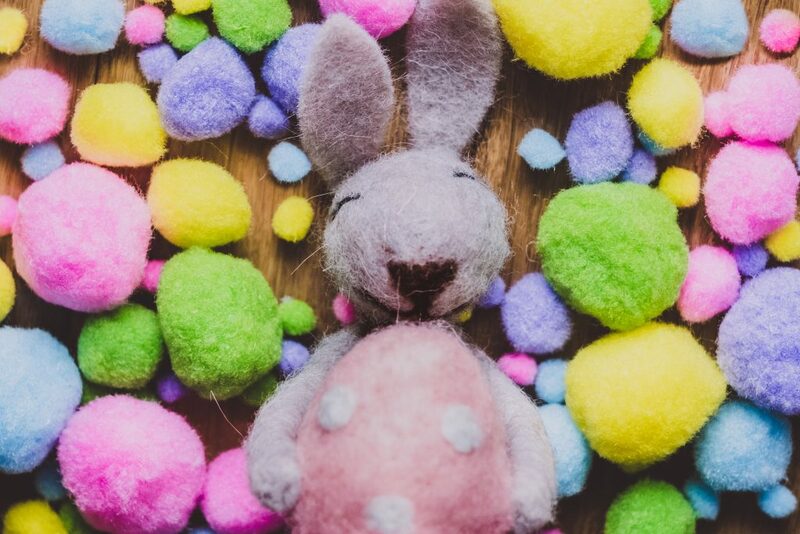 The Horniman Museum and Gardens are hosting a two-day fair to celebrate all things Easter on Saturday 20 and Sunday 21 April. Face painting, Easter trails and hunts, family activities in the gardens and much more is on offer across the weekend. If it’s your first time at the Horniman, make sure you allow yourself enough time to explore everything that is on offer. It first opened in 1901 when Frederick John Horniman decided to put his collection of fascinating objects on show. Explore objects from different cultures in the World Gallery, view tropical fish at the aquarium and visit the alpacas at the animal walk. Unlike a lot of museums, getting up close and personal with the objects is highly encouraged. If it’s a bit chilly head to the butterfly house where hundreds of tropical butterflies free-fly in a wonderfully warm and humid indoor garden. If you decide to visit on a Saturday, don’t leave without first paying a visit to the amazing Farmer’s Market that runs from 9am-1:30pm where you can grab fresh and tasty produce to eat now or to take-away. Dairy Milk lovers rejoice! Cadbury are back this year with their classic Easter Egg hunts that take place around National Trust sites across the UK. Each hunt offers something slightly different and most of the hunts also require admission into the grounds, however this gives you the perfect excuse to plan a full Easter day out with all the family. There are three main hunts close to Central London: Fenton House and Garden, Sutton House, and Morden Hall Park. The beautiful 17th century Fenton House is just a five-minute walk from Hampstead station. Once there you can explore sunken gardens, stunning terraces and emerald lawns in the hunt for Cadbury’s chocolate treats. At Sutton House, learn about its history as you experience life as a prominent Tudor and shift into the 1980s when squatters took over Sutton House and turned it into a music and social venue called Blue House. Striking artwork from this time still remains. Modern Hall Park made its fortune from the 18th and 19th-century snuff industry when at peak production they were making 6000lbs of snuff every month. After the swift decline of snuff during the early 1920s, the Hatfield family decided to close the mill where they became the estate’s workshop. In 1989 the western mill was opened as a classroom and education centre. During your visit you can really get a feel for how life was for those Victorian mill workers with an interactive exhibition. Whichever Cadbury hunt you decide to visit, you can be assured that it will be delicious and great fun for all the family. Located only 10 minutes from Hammersmith, this urban oasis is the perfect place to relax among the lakes, ponds and gardens. From Saturday 6th- Monday 22nd April, the Wetland Centre will be putting on a Giant Easter Duck Trail where you need to find the yellow ducks hiding amongst the reeds, trees and with the real-life ducks themselves. At only £1 per trail (with prize included) and admission to the centre £35.54 for a family ticket, it’s the perfect place to spend a sunny April day. Once you’ve completed the trail make sure you stick around for pond dipping, wild play (where you can learn all about how birds behave in spring time and make a giant nest yourself) and explore animal tracks to become an animal track detective. If you want a scenic route home from the centre, head along the River Thames towpath towards either Putney or Hamersmith Bridge (it should take about 25 minutes). Battersea Park Zoo is once again hosting its fun and eggciting Easter Egg Hunt, where stripey, spotty and colourful eggs will be hidden across the animal enclosures around the zoo. Whether you have your own cheeky monkey, wise owl or inquisitive meerkat in your family, you can find a favourite animal for everyone. Arrive early and schedule in at least one of the feeding time sessions before completing your Easter Egg Hunt. Finish off the day with a trip to the adventure playground where your little ones can build sandcastles, climb, swing and slide or let their imagination run wild on the tractor or fire engine. Make sure you grab a tasty treat for the way home from the onsite Lemon Tree Café. On Monday 22nd April, The Royal Mews at Buckingham Palace are putting on a horse-themed Easter Event that is bigger and better than ever before! Included in your general admission price, this one day extravaganza has the whole family searching for hidden horses across the Mews in order to win a delicious chocolate prize. The Royal Mews is one of the finest working stables in existence and arranges all of the road travel arrangements for The Queen and the Royal Family. Entry for a child is £6.80 or free for under 5s with an adult ticket just £12. By treating your ticket as a donation however, you can enjoy free return trips to the Royal Mews for a whole year. Learn about the two types of horses that are used to pull the carriages at the Mews, have a go at tacking up your own wooden pony, and try out a Royal carriage. Easter inspired arts and crafts are also on offer throughout the day. Situated in between Moorgate and Liverpool Street is the beautifully chic and modern South Place Hotel. Whilst this is perhaps more suited to adults, children are more than welcome to participate. This 5* boutique hotel might not be the first place you think of for an Easter Egg hunt however for only £10 you can enjoy a more luxury Easter experience. In collaboration with gourmet chocolatier Maison Samadi, follow the clues and riddles and make your way around the hotel, finding delicious chocolate along the way. You may also find some special South Place Hotel exclusive prices as well as a final treat at the finish. Once you’ve finished scouring the hotel for individually-wrapped tasty treats, head down to the South Place Chop House and enjoy a delicious two-course brunch menu on Good Friday, or if you’re going on Easter Sunday, they’re offering a traditional roast for only £20 per person. If you visit any of these egg-stremely tempting Easter Egg egg-travangazas, do let us know via Twitter!